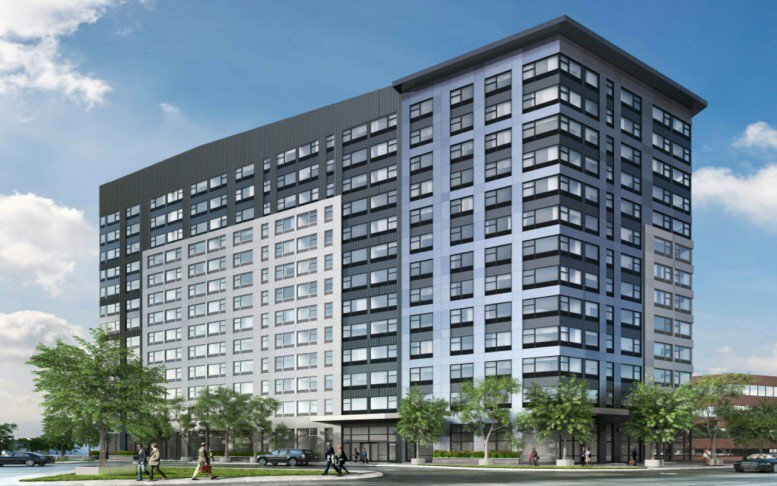 Construction has topped out on the 13-story, 240-unit mixed-use building under development at 3 Journal Square Plaza, in Jersey City‘s Journal Square section. Photos of the structure were recently posted to the YIMBY Forums. Dubbed The Residences at 3 Journal Square and revealed by YIMBY roughly a year ago, it will encompass 219,446 square feet. There will be retail space and residential amenities on the ground floor, followed by rental apartments above. Known amenities include a four-level underground parking garage, which the project was built atop, and a rooftop terrace. Hartz Mountain and Panepinto Properties are the developers. Marchetto Higgins Stieve Architects is the design architect and the Childs Dreyfus Group is responsible for the interiors. Tocci Building Companies is managing construction. Completion can probably be expected by the end of the year.